I have been debating back and forth on whether or not I am going to do an April cookbook review. Because of the computer issues I had a few weeks ago I am so far behind on so much stuff not just blogging; and April is half way over anyways… so I don’t know. I will have to think about it and if I do have a review maybe just do it next week and post a recipe each day for the week. Anyways, the April Pillsbury recipe is actually a recipe I am sure everyone out there knows and loves. It is one that I have been making since I was a kid and and one that I was actually going to blog about many times ago (that is how frequently I make it) but never got around to blogging it or my pictures turned out awful (not that I am saying these pics are great but they are WAY better than the others I have). 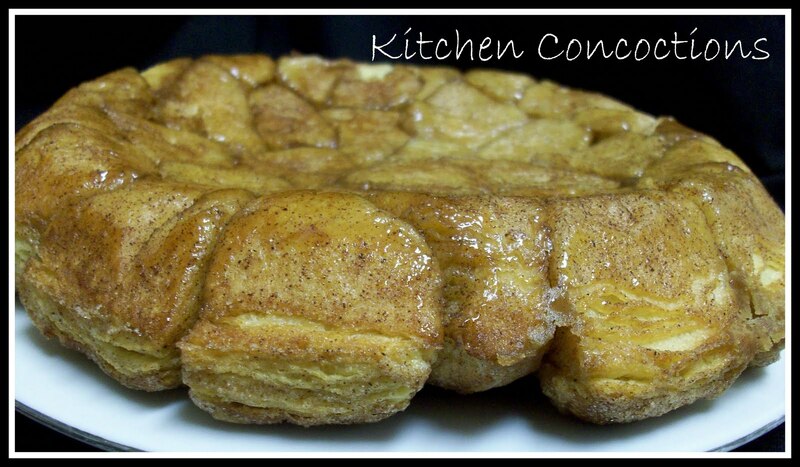 The recipe I am talking about is Pull Apart Bread a/k/a Monkey Bread. I know this is a classic and like I said I have been making it for years now but I thought I would share. There are probably a million different ‘versions’ of this yummy and comforting breakfast/brunch item; but the basic ingredients are pretty much the same: biscuits, sugar, cinnamon, more sugar, and butter. How can you go wrong with this simple, classic, easy, yummy breakfast comfort food. Like I said in the Pillsbury calendar they had their version and I have seen several different versions over the years but the concept is all the same (I wonder who actually came up with this idea… was it Pillsbury?). Anyways my version is below! Melt 1/3 cup brown sugar and butter in pan. Cut each individual biscuit in quarters. 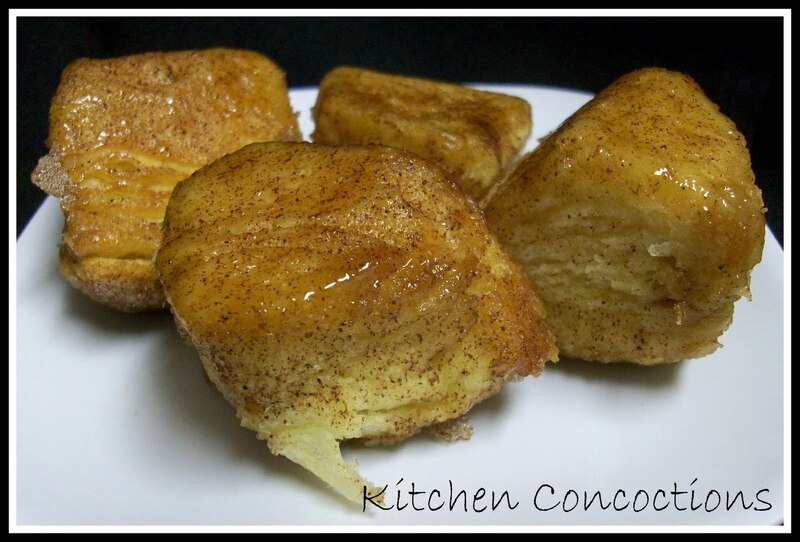 Mix cinnamon, white and remaining brown sugar in a ziploc bag. Add cut biscuits 2 to 3 at a time to bag and shake bag until biscuits separate and are coated in cinnamon and sugar. Grease a pie plate and arrange sugar coated biscuit pieces in a single layer in pie pan. Pour brown sugar and butter mixture over biscuits. Bake at 350 for 15 to 20 minutes, or until golden brown.